Ceridwen Fraser grew up in Canberra, Australia, and early in high school decided she wanted to become a marine biologist. Many tried to discourage her, saying there were few jobs in marine science, so Ceridwen did a university degree in art conservation—but she eventually had to admit that biology was still her dream, jobs or no jobs. 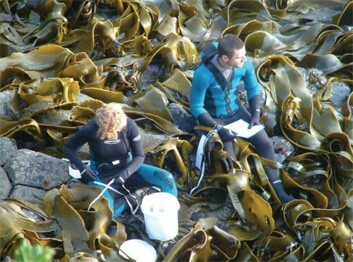 She started a degree in Marine Science at James Cook University in tropical northern Australia, finished it off at Macquarie University in Sydney, worked for a year in the marine invertebrate research group at the Australian Museum, and then began a PhD in the Department of Zoology at the University of Otago, New Zealand, which she completed in 2009. Crid is now a postdoctoral research fellow at The Biological control and Spatial Ecology Lab. within the Université Libre de Bruxelles. Since starting her degree in marine biology, she has never looked back, and instead looks forward to an exciting career filled with discovery and adventurous fieldwork. Hamish Spencer is Principal Investigator with the Allan Wilson Centre for Molecular Ecology and Evolution, and Principal Invesitgator with the National Research Centre for Growth and Development. He is an Honorary Research Fellow with the Liggins Institute, University of Auckland. His research interests include the maintenance of genetic variation in populations, the population genetics of genomic imprinting and population-genetic theory for frequency-dependent selection.